Last night was a fantastic evening with David Mirassou of Mirassou Winery from Monterey California. 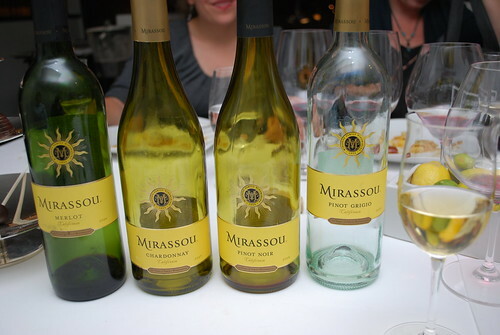 The Mirassou Winery is America's Oldest Winemaking Family and the dinner at the amazing TRU restaurant was to celebrate their 155th Anniversary. Joining me at the table were fellow Chicago foodie blogger friends and Chicago food writers/journalists including, Tammy Green and Bridget Houlihan of Chicago Bites, Louisa Chu of Moveable Feast, Chuck Sudo of Chicagoist, Josh of Chicago Foodies, Jill of Gaper's Block, and a few others. We were completely spoiled with delicious food and wine, which came in second only to the company and conversations we all enjoyed. 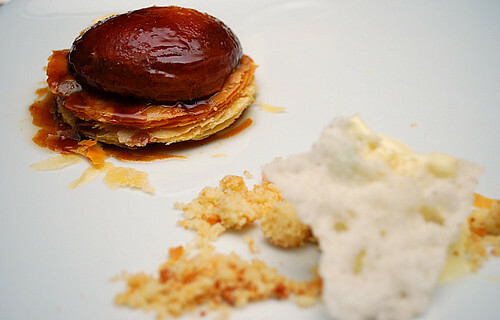 Our dinner consisted of a six-course tasting menu which was created and perfectly paired by Chef Gale Gand. Chef Gale and the TRU staff walked us through each course while David shared his tasting notes for every paired wine. It was evident there was a lot of thought and care in formulating the dinner. Each wine has a special characteristic that must be considered. Previous wine tasting dinners I've had paired wines to the courses served, however for this dinner, the opposite is true. The wines were the star and the courses prepared elevated the wines to highlight their nose, flavors and finish. It was a job well done by Chef Gale and her staff. We started with an amuse bouche. 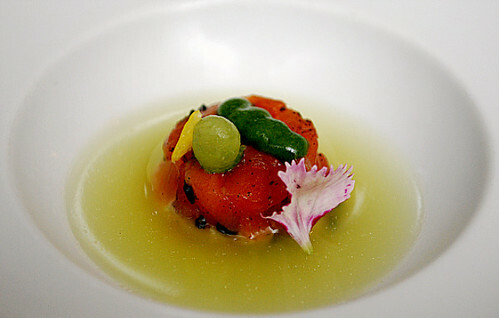 This beautiful bite is salmon, surrounded with a cucumber gelee, cucumber skin puree and edible flower. It was a refreshing way to start and cleanse the palate. 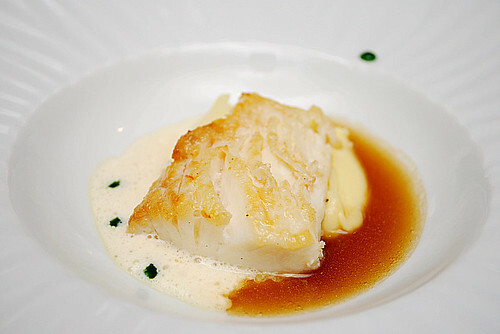 We began with a warm starter course of Nova Scotia Halibut. Gorgeously presented in ying yang fashion, the halibut sat atop a reduced Chardonnay sauce and bacon vinaigrette dressing. 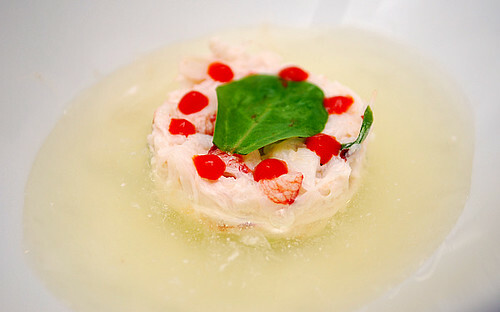 Accenting the dish both aesthetically and with flavor is a parsley emulsion. This course was paired with a 2007 Mirassou Pinot Grigio. Definitely one of my favorite courses of the evening, the buttery halibut paired perfectly with the Pinot Grigio and the accompanying flavors of the Chardonnay reduction and bacon vinaigrette was amazing. 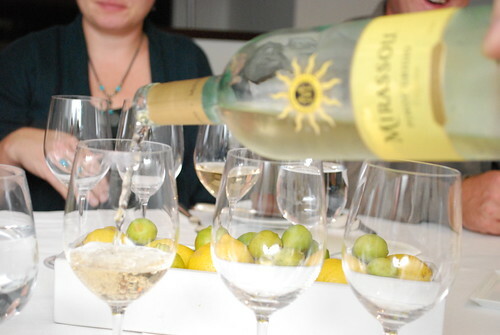 The 2007 Mirassou Pinot Grigio shows how refreshing Pinot Grigio can be.It's a crisp, clean wine that features subtle peach and citrus flavors. This versatile Pinot Grigio pairs beautifully with spicy dishes as well as grilled poultry or seafood. It can be enjoyed immediately upon release and should be able to age in the bottle for up to one year. Offering flavors of lemon-lime and peach with subtle floral notes, our Mirassou California Pinot Grigio is a bright expression of California's most celebrated growing regions. 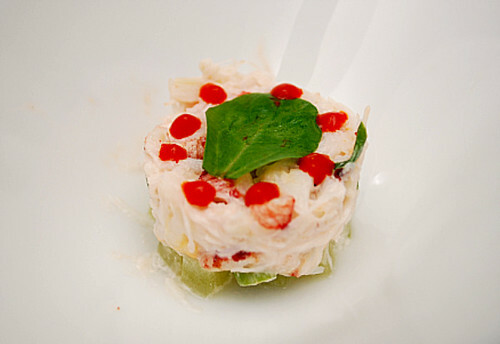 Second course was a cold Peeky Toe Crab Salad. The presentation of this salad was beautiful. In the bowl was the peeky toe crab on top of diced cucumber. Decorating the top was a single piece of mache and a chili pepper emulsion. Gently poured into the bowl is a refreshing tomato water. 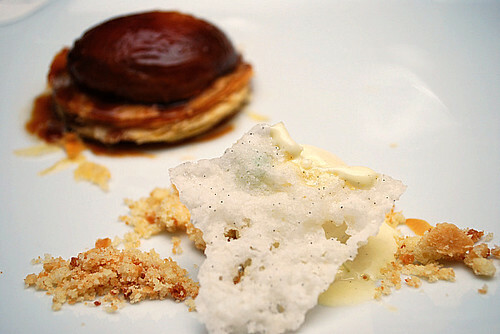 This course was paired with a Mirassou 2008 Sauvignon Blanc. The Sauvignon Blance is very smooth with flavors of sweet peaches. 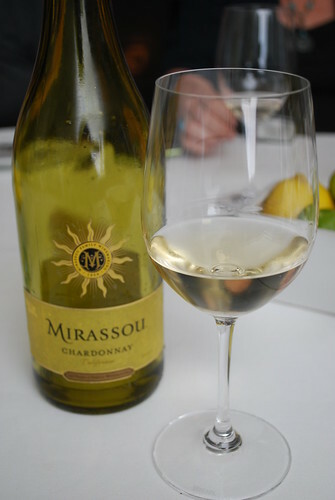 This Mirassou Sauvignon Blanc has a soft mouthfeel and crisp flavors of tropical fruit. I also tasted some hints of melon, grapefruit and pear. Third course was another favorite of mine. 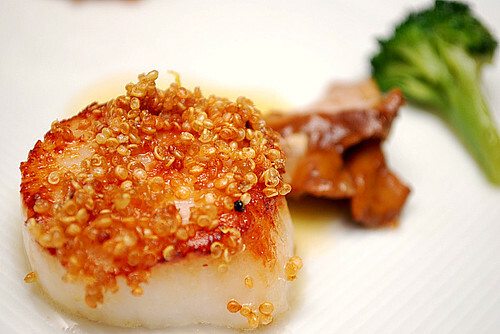 This is a Quinoa Crusted Scallop with broccoli, chanterelle mushrooms and crushed peanuts. Who knew that quinoa could be toasted and used as a crust?! I'm looking forward to trying this concept at home. The flavor is nutty and really compliments the crushed peanuts. 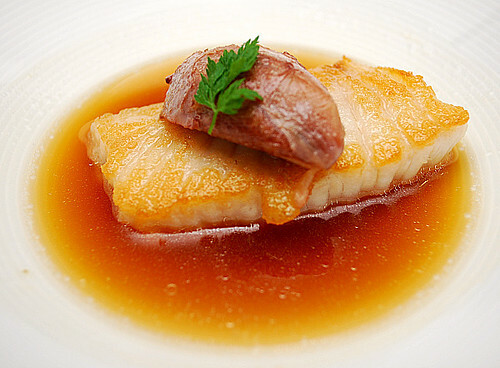 With the earthy flavors of the chantarelle mushrooms, it was perfect! 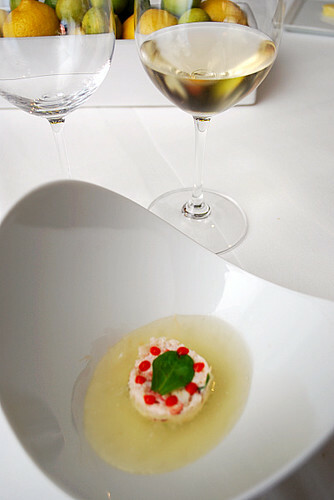 This course was paid with a 2007 Mirassou Chardonnay that really played with the all the flavors nicely. I really enjoyed the Chardonnay because it wasn't the typical oaky flavor I was expecting. Instead, this Chardonnay has intense aromas and flavors of stone fruits such as peaches and nectarines. There were some additional hints of melon, pears, citrus, floral and vanilla notes. The creamy mouth feel was very clean and had a nice concentrated finish. Fourth course was a Roasted Skate. Atop the skate was duck confit and the entire dish was surrounded by a roasted garlic consomme.The saltiness of this dish paired well with a 2008 Mirassou Pinot Noir. 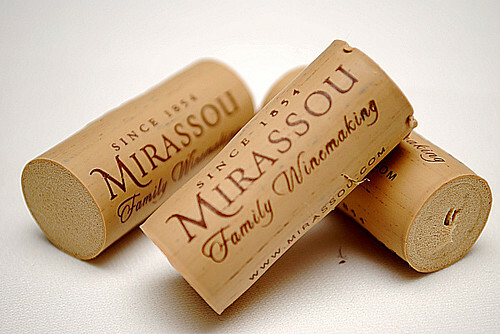 The Mirassou Pinot Noir is the best selling California Pinot Noir and is a signature varietal of Mirassou. With a nose of cherries and a mixture of berries, this Pinot Noir has a silky finish. 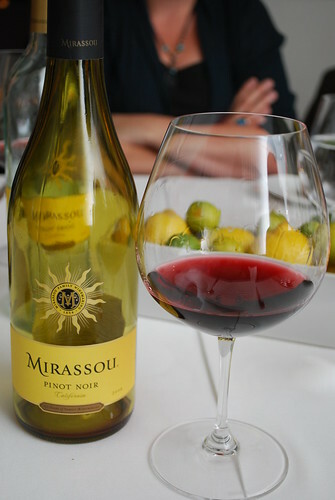 This Mirassou Pinot Noir displays fresh fruit flavors of pomegranate, cherries and currants with complementing aromas of strawberries, pomegranates and cherries. This wine is at its best if enjoyed within a year of release, but can age in the bottle for up to three years if carefully cellared. Fifth course was a Salt-Crusted Cervena Venison. 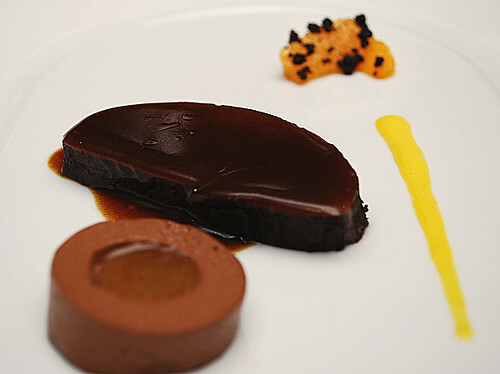 The slice of venison was accompanied with a cocoa mousse filled with an olive gel, blood orange puree and a cocoa crusted tangerine slice. It may seem like an odd combination but it worked! The venison had a slight gaminess but wasn't overpowering when eating with the orange and cocoa mousse. This was paired with a 2006 Mirassou Merlot. The Merlot cut through the saltiness of the dish and really balanced it out. 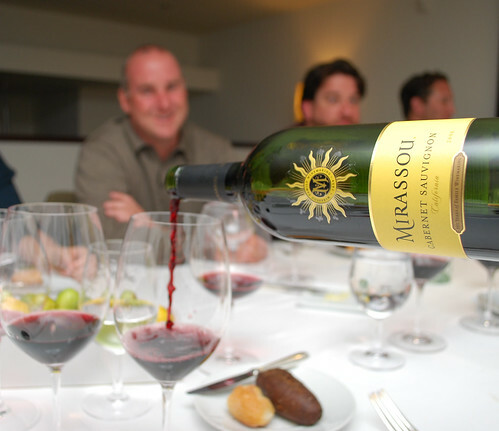 This Mirassou Merlot is made of luscious fruit flavors of black cherry and blackberry. 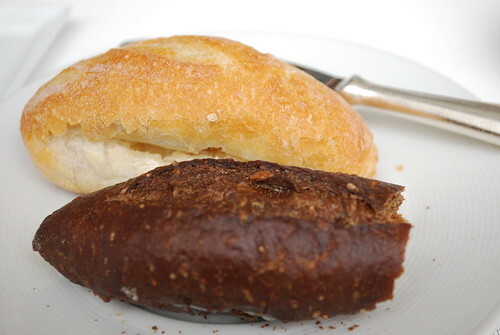 These primary flavors are augmented with flavors of vanilla, toasty oak and brown spices. The addition of Zinfandel and Syrah varietals contribute to a full-bodied mouth feel and lingering, smooth finish. Sixth course was probably my most favorite course of them all. We had Short Rib which was served with a cocoa nib isomalt and coffee mash. 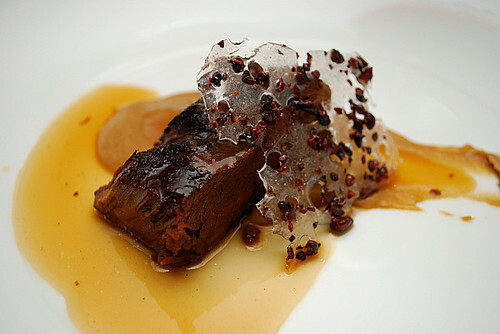 Isomalt is a sugar substitute and in this dish, it was used as a sugar shard with bits of cocoa nibs. The combination of cocoa/chocolate and coffee is amazing in dessert but here as a savory dish, it was amazing. 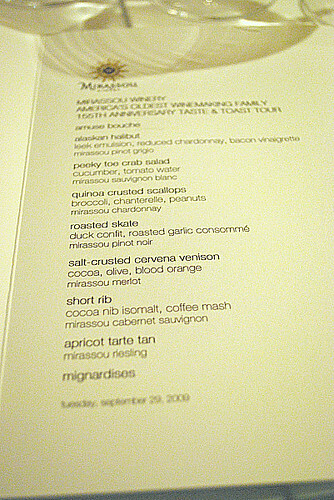 The course was paired with a 2006 Mirassou Cabernet Sauvignon. Another spectacular pairing where the rich, jammy flavors of the Cab were heightened more with the flavor of cocoa and coffee. 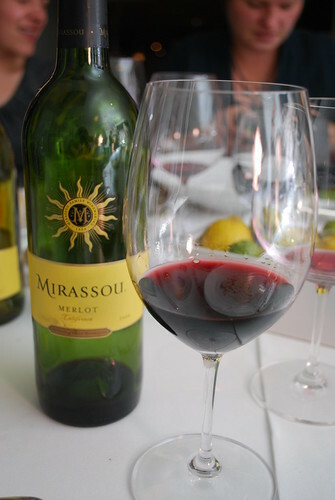 This 2006 Mirassou Cabernet Sauvignon has flavors of deep rich blackberry and black currant flavors. These flavors are complimented with additional hints of vanilla and spices. This is a full bodied wine with a soft finish. And now comes dessert. I made sure to have enough room for Chef Gale's sweet creations that she's known for. To end our meal, she prepared a Nectarine Tarte Tan with a sour cream ice cream. This amazing ending was paired with a 2008 Mirassou Riesling that had a sweet, apricot and peach notes. 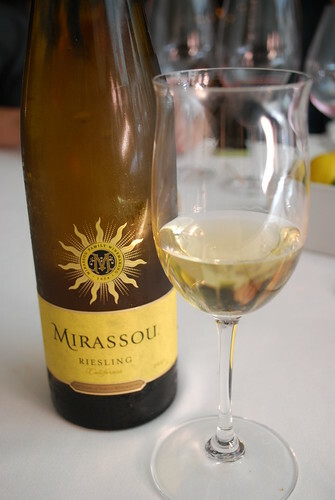 This 2007 Mirassou Riesling is distinctly soft and approachable yet crisp and fruit-forward. The wine offers aromas of peach, apricots, and spice with intense fruit flavors of red apple and peach. As a result of the naturally firm acid levels, this wine is crisp and delicately structured and pairs beautifully with richly sauced poultry or seafood. Now a dinner at TRU doesn't end with dessert. 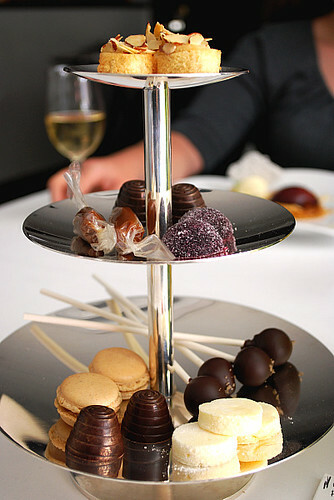 At TRU, they have a beautiful tiered dish of Mignardises. Tonight, Chef Gale provided us with Mini Almond Tarts, Buttery Caramel, Maracons, Chocolate Truffles, Peanut Butter Chocolate Lollipops, and Marshmallow Rounds - heaven! David Mirassou represents the sixth generation of America's oldest winemaking family. These days, David serves as Mirassou Winery's spokesperson, and is involved in may of Mirassou Winery's daily activities. David has been touring the country celebrating Mirassou's more than 150 years of winemaking, as well as introducing the Mirassou Winery's new premium wines. Growing up at the family's history winery, David has been involved in every aspect of the winemaking process, from planting and harvesting to barreling and bottling. David knew at an early age that he would continue to be involved in the wine business. 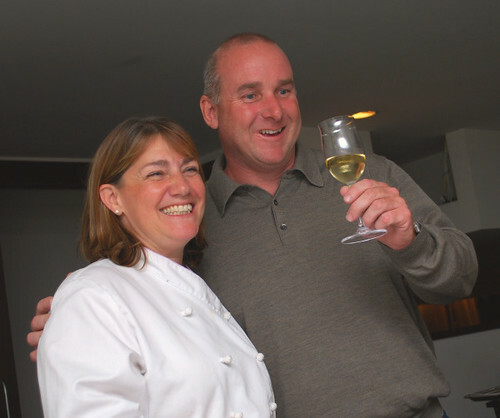 Throughout his life, David's passion for wine has flourished. He believes that in the past 20 years, the vintners of his state have surpassed the rest of the world in their craft through their willingness to experiment with new processes in winemaking, while simultaneously respecting tradition. I must say that although TRU restaurant is a fine dining establishment, they have impeccable service that makes you comfortable and relaxed, which is not always the norm at other fine dining restaurants. 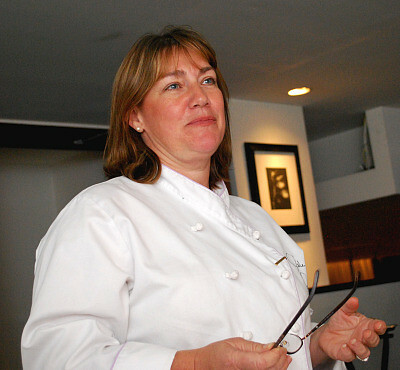 Chef Gale shared with us her own experiences dining at lavish restaurants and realized that the atmosphere must be just as comfortable and relaxed as the food is spectacular to provide diners a lasting, positive memory. With that, I left the dinner longing to go back once again. This looks like a fabulous evening! I love the idea of the toasted quinoa.. let me know if you try it at home! Your pictures are beautiful in this post - very crisp. They look like they could be in a magazine. Wow! Lucky you! Tru twice in two months!! Looks like an absolutely fabulous evening! You've captured the evening beautifully in your photos!